Cumin (Cuminum Cyminum, Linn.) is a low-growing annual herb of the Nile valley, but cultivated in the Mediterranean region, Arabia, Egypt, Morocco, India, China, and Palestine from very early times, (See Isaiah xviii, 25-27 and Matthew xxiii, 23.) Pliny is said to have considered it the best appetizer of all condiments. During the middle ages it was in very common use. All the old herbals of the sixteenth and the seventeenth centuries figure and describe and extol it. In Europe it is extensively cultivated in Malta and Sicily, and will mature seed as far north as Norway; in America, today, the seed is cataloged by some seedsmen, but very little is grown. The plant is very diminutive, rarely exceeding a height of 6 inches. Its stems, which branch freely from the base, bear mere linear leaves and small lilac flowers, in little umbels of 10 to 20 blossoms each. 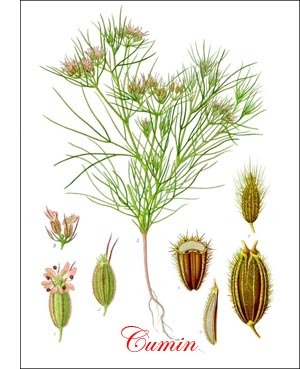 The six-ribbed, elongated seeds in appearance resemble caraway seeds, but are straighter, lighter and larger, and in formation are like the double seeds of coriander, convex on one side and concave on the other. They bear long hairs, which fold up when the seed is dry. After the seed has been kept for two years it begins to lose its germinating power, but will sprout reasonably well when three years old. It is characterized by a peculiar, strong aromatic odor, and a hot taste. As soon as the ground has become warm the seed is sown in drills about 15 inches apart where the plants are to remain. Except for keeping down the weeds no further attention is necessary. The plants mature in about two months, when the stems are cut and dried in the shade. The seeds are used in India as an ingredient in curry powder, in France for flavoring pickles, pastry and soups.